This past Saturday, my fiancée and I were attending our weekly premarital counseling sessions at the church. The class is full of other couples preparing for their weddings and also a few couples already married looking to enrich their marriage. This was our 9th class out of the 12 week course. Anyway, midway through the program, the facilitator informed the class that there was another program going on in the church that he wanted us to briefly attend if we had time. So a number of us ventured downstairs to the fellowship hall where they were having a prayer breakfast for Breast Cancer Awareness. Those in attendance primarily consisted of Cancer survivors, caregivers, family and friends. As I walked into the room, I sort of felt uncomfortable. All the folks attending the prayer breakfast were dressed up and looking sharp and here I was wearing some jeans, a sweatshirt and sneakers. However, we were extended a friendly greeting and ushered to some tables in the back of the hall. I sat there listening quietly to a number of people from different organizations talk about Cancer and how they are trying to assist those dealing with the disease. From that point the various victims of Cancer stepped to the podium one by one and told their stories. Each one of them shared personal testimonies of their trials and tribulations. They talked about the pain they endured, yet how their belief in God remained strong. It was very emotional at times. People began to shout “Hallelujah” all over the fellowship hall and began to praise God aloud. I began to reflect upon the family members that I have lost over the past few years from Cancer and those who are currently dealing with it. I thought about the months of pain management treatment that I underwent in 2004 at the Cancer Institute at Washington Hospital after the electrocution 2 years before that in 2002. I used to sit in the waiting room at the hospital and talk to Cancer patients while there for my appointments. Although dealing with pain from internal burns to areas in my chest, I knew that those folks were suffering much more than I was. Yet, most of the people I encountered there were pleasant and in good spirits. Sitting in the fellowship hall that afternoon and listening to the testimony of those women, made me feel as though the pain I’ve been dealing with was small in comparison. The song Running Away by Bob Marley came to mind when he sang “Every man thinketh his burden is the heaviest. Who feels it knows it, Lord“. I wasn’t dealing with anything at all. I’m listening to these beautiful women talk about having their breasts removed and going through surgery after surgery after surgery. It humbled me in a way. It wasn’t just the fact that they talked about the struggles that they went through, but more for the joy and zest that they had for life. Yes, there were many moments where I got teary eyed. It was impossible not to get emotional in that environment. One of the themes that the keynote speaker spoke about towards the end of her speech was to “aspire to inspire before you expire“. That phrase has been stuck in my head since Saturday afternoon. I’ve been pondering that thought and have begun to ask myself a number of questions. What is my purpose? What do I aspire to be? How can I inspire others to greatness? What do I need to do before I expire? I suppose the reality is that we don’t really know who we impact by our words or our actions. How much of an impression do we have on the world? How much better would our lives and the lives of others be if with each action we had the intention to inspire? Instead of just trying to make it through each day and along the way complaining about our circumstances, we were devoted to being the best that we could be? What if we all believed that by being genuine that we could motivate and light a spark of positivity in others? I honestly realized the power of my writing when I wrote a blog entry in April 2005 in remembrance of my best friend who committed suicide. I had no choice but to write that day because my heart was heavy. It’s not a situation that I like to discuss that often, but I felt the need to talk about it that day. I received only a few comments on that entry, but the response by email was overwhelming. A lot of folks who either were contemplating suicide, were close to someone who committed suicide or dealing with depression or family issues of some sort in their lives emailed me. A number of people thanked me for sharing my story. I even held email conversations with some of those folks about their sadness. Many of the people who mailed talked candidly about their own problems. Sometimes people are dealing with things and feel like they’re alone. I’m no different. At times I’ll read something that someone has written and it will touch my heart or hit close to home. You never know who you may help by telling your story. I did feel like I was able to help some folks that day. Folks that I don’t know or have never met. But people who may have been at the end of their rope. I miss my man Eddie, but I feel like if I continue to talk about the situation, that it may help someone going though a crisis, while at the same time it is therapeutic for me as well. Some of my entries are of a serious nature, while some show my sense of humor. I’ve always been a writer and this forum allows me to scratch the itch of a young kid who at one time wanted to be a journalist. Reflect upon a time in your life when someone had a huge influence upon you. Maybe something that they said or did facilitated a positive change in you. Maybe their words gave you a boost of confidence or the desire to move forward and not look back. It could’ve been anybody from a school teacher to a famous athlete or entertainer to a close friend or maybe even a total stranger. No matter who that person was, they quite possible made a strong impact in your life. It could’ve been from one simple sentence to long conversations over an extended period of time. Many times it’s the little things that mean so much to us in the larger scope of life. It’s the indiscernible force field of positive energy that inspires us to believe in the possibilities, to be valiant and tenacious and to move forward. However because everything we say or do is not necessarily acknowledged, we’ll never know the true impact that we have upon others. Nevertheless, each of us have positive spirits within us. We all have the power to invigorate and affect others. If we live our lives with the desire to spark positive vibes and to inspire others, just imagine how wonderful that would be. Just food for thought y’all. Have a good day. 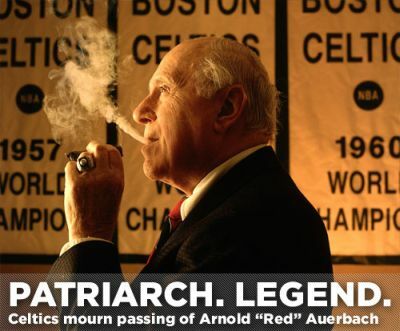 On a sad note, Red Auerbach died on Saturday night of a heart attack. 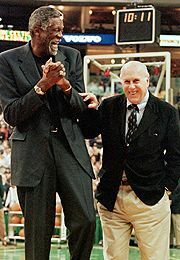 Red was the President of the Celtics and was responsible for bringing 16 world championships to the Boston Celtics organization. As I’ve mentioned a number of times on this blog, I am a true Celtics fan. I’ve became a fan watching Tiny Archibald play in the late 70’s, early 80’s. 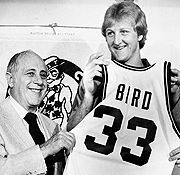 Anyway, I met Red Auerbach when I was about 10 years old. My dad was working for the Washington Bullets at the time and I was at Capital Centre for a Bullets-Celtics game. Pop introduced me to Red and his brother Zang a few hours before the game. During the game I sat in the row directly across from him and he even got me an ice cream cone. Contrary to his public image of being tough, he was really a nice, friendly guy. I’ll never forget that day. 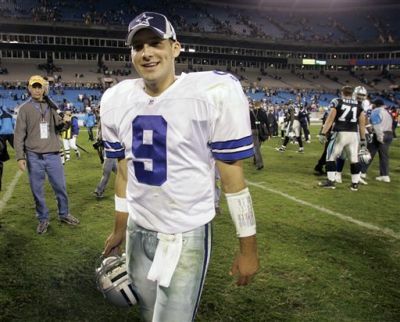 On a much happier note, I’m truly excited right now about the Cowboys victory over the Panthers tonight. When the game started with us down 14-0, I had to take a deep breath. 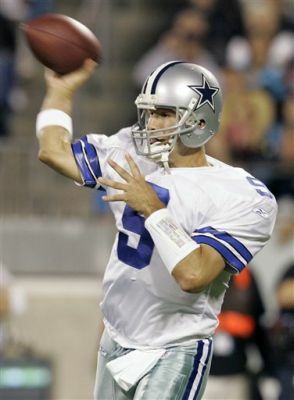 But with QB Tony Romo at the helm, the team fought back and took care of business. 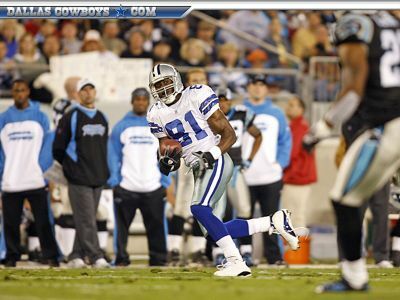 He found Terrell Owens early and often. 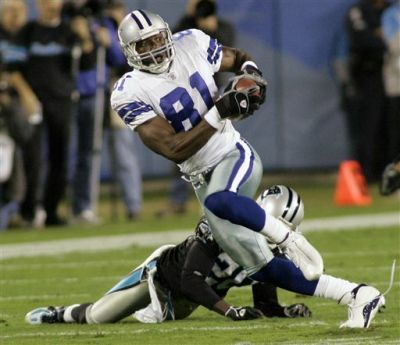 Both Julius Jones and Marion Barber ran like madmen. Roy Williams made a key interception and the D stepped up and made huge plays. I’d also like to take a moment to thank Keyshawn Johnson for his crucial drop of a sure TD in the 3rd quarter and the rest of the Panthers offense for playing awful in the 2nd half. 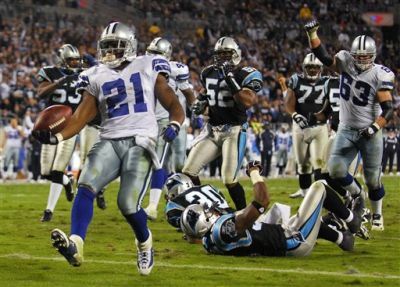 Oh well, can’t ignore the final results Cowboys 35 Panthers 14. Next week we’ve got the Redskins. Best believe I’ll be at FedEx Field next Sunday with my Cowboys gear on, talkin’ trash and rooting for my ‘Boys. That’s about all I’ve got for today. Sometime around 6:30pm yesterday afternoon my phone rang. My Orthopaedic doctor was calling to give me the results of the MRI I had last Friday. Once I answered the phone he immediately began to ask me how I was feeling. Right then and there I knew the news wasn’t going to be good. Normally when my tests and radiology results come back and there are no problems, he tells me instantly. Anyway, we chatted for a minute or so and then he broke the news. He informed me that I’m suffering from Cervical spondylosis and that’s what is causing my neck pain. Basically my cervical discs C5-C6 and C6-C7 are worn down. I have all the symptoms of a person who suffers from this health issue. I have constant neck pain and stiffness, headaches quite often, loss of balance at times, and loss of sensation and weakness in extremeties. I took a deep sigh. I already knew that something was wrong and this was just the confirmation. So not only do I have the issues with the degenerative disc in my lumbar spine causing back pain, I now know why my neck has been hurting also. I’m not gonna even act like the news is not disheartening in some way. I began to think back to all the injuries I suffered in my lifetime. Could it have been when I hurt my shoulder while in the Navy in 1990? The military doctors told me 16 years ago that I may have problems later on down the line. Subsequently every so often when I get treatment at the VA Hospital, the doctors there say the same thing. But was this related to that shoulder injury? Right now I’d trade every single disability check received from the government for the past 12 years just to be pain free. Then again I’ve had so many freak accidents in my days that it could’ve been so many different things or a combination of all of them. I’ve moved more times in the past 10 years (7 moves to be exact) than some folks move in a lifetime. I guess I can’t expect my body to hold up after carrying furniture, heavy equipment, boxes and stuff that often. I’ve been in a few car accidents which left me banged up and sore. I suffered a concussion in 2001 playing basketball, where I fell flat on my back while fighting for a rebound. I wore a collar from that accident for at least a week and had serious neck stiffness. Hell, I’d be here all day trying to pinpoint the exact incidents which may have contributed to what I’m dealing with now. I’m trying not to be angry about this, but it’s hard. When you wake up every day wincing in pain, it’s not a good feeling. I struggle a lot more than I’m willing to admit to those who see me each day. I feel like if I fuss or complain about being in pain that no one will care anyway, so I remain silent. As I said before I’ve successfully recovered from being addicted to painkillers for the most part. Yeah I still have Percocet and Vicodin in the cabinet, but it won’t do any good. Is that recovery or have I just built up a tolerance? Oh well, regardless I’m not taking them. I talked to the good doc for close to 30 minutes about my next move. Again, he basically said that most people just live with it until they can’t bear it anymore. He said that whatever treatment plan I choose is entirely up to me. The options are pretty much the same as before. There’s epidural injections, seeing a Chiropractor, acupuncture, massage therapy, wear a neck brace occasionally or just do nothing at all. Anything surgical would be well after those options have been exhausted. Maaaaan… I’m tired of walking around all hunchbacked because it hurts to stand up straight. But that’s the only way to lessen the amount of pain I’m in. I won’t take any pain medication or anti-inflammatories, but I will occasionally take a muscle relaxer because it does help me sleep. Trying to adjust the pillows at night is not a fun task. I swear that I must move at least 50 times in a 10 minutes span to try and get the right comfort level. For now I just have to limit activities which place pressure on my head, neck, and shoulders. I have to continue to exercise, but I need to participate in low-impact activities like swimming or yoga. 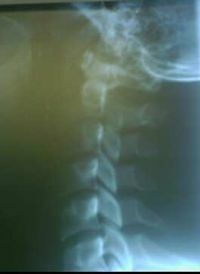 Aside from that I’ve got to use good posture while standing, sitting, driving, sleeping and while at the computer to prevent further damage to my spine. Most importantly from my own perspective, I must keep my level of stress down. Stress does nothing more but make matters worse. But now I realize that it’s not just emotional, but physical as well. My advice to my people reading this right now is to take care of yourself. Not saying that I haven’t done my best to do so, but I’m sure that I could’ve done a lot better. It’s almost 4am and I’m wide awake again. Why is that you ask? Well, it’s cuz a brotha is in pain. A lil’ over a year ago the good doc informed me that I had a degenerative disc in my lumbar spine. This is defined by medical professionals as Degenerative Disc Disease (DDD). Doc explained to me that it’s not really a disease, but more of an aging process through wear and tear. I don’t care what they classify it as, all I know is that it hurts like hell!!!!! I’ve been in extreme pain the past 3 months and made a special trip back to the doctor’s office last week to ensure that no further issues had developed. The x-rays didn’t show anything different though. I don’t know if that’s a good thing or bad thing. As much pain as I’ve been in I began to wonder if I had another injury somewhere. Basically, the same degenerative disc between my 6th & 7th vertebrae is still plaguing me. I wanted to make sure that no further problems had developed however, so I had an MRI on Friday night. That’s another thing in itself. I’m not fearful of having MRI’s, I just don’t like having them. Laying stiff in a casket-like cone for 90 minutes with earplugs in my ears to suppress the loud clanging and vibrating is not my idea of a fun time. I’ve had the process done at least 7 times in the past 13 years including 3 times in the past 3 years. I’m really coming grips with the fact that I’m getting older. Each day I have to drive for at least an hour each way as I commute to work. Most of that ride is spent sitting in traffic. I’m really starting to contemplate if it’s really worth it. I mean, the frustration in dealing with knuckleheads on the Beltway is enough to drive any sane person mad. But sitting in stop and go traffic raises the level ‘slightly’… lol. I tend to notice more soreness and discomfort the minute I step from the car into the office and also when I arrive home after each work day. However I do know that when I’m moving around, I do feel at my best. It’s those points when I’m not able to stretch or move freely that I’m in the most pain. I suppose in a way that’s why it’s so difficult for me to get going each morning after laying in bed for at least 6 hours. I think I’ve honestly tried to maintain as much as I can without popping pills again. It really has come to a point where the recommended dosage of narcotics and painkillers do nothing for me, so I don’t take them much anymore. I’ll take an occasional muscle relaxer, but that’s more to try and sleep peacefully than anything. Obviously I didn’t take one last night. I experiment with drinking tea as a way to calm my nerves or use a Thermophore heating pad on my back as I lay in the bed. I actually find that when I’m the most active, is when I don’t feel the pain as much. I’m playing flag football once a week and I played basketball for a good part of the summer in the work summer league. Well, let me re-state that. I don’t feel as much pain when participating in the activities, but afterwards… Good Lawd!!!! So, I’m still waiting for my MRI results from last Friday. With each thought of what will be revealed to me, I wonder how I will approach it. I’m just trying to cope with it ya know? I don’t have any intention of getting any kind of spinal fusion surgery or epidural injections. But I do wonder if there’s another solution to the pain like going to a Chiropractor, or having acupuncture or massage therapy. Right now, I just wanna go back to sleep. These nights of waking up in pain are taking their toll on me. When it’s time for me to get up and go to work, I’m sleepy and then I’ve got to sit in traffic. That makes for a great way to start the day doesn’t it? I’m trying not to get frustrated with this. All I keep hearing from folks is that a lot of people have back problems after the age of 30. Ummmm… that doesn’t make me feel better people. Doc even told me that he has back problems too. I do appreciate him though because he refused to give me any more meds cuz he knows it’s just masking the true problem. In his words, “some folks just live with it”. That wasn’t exactly what I was looking for from him, but it was the truth. However the thought of waking up each morning and struggling to do ‘normal’ things without pain is somewhat disheartening. I suppose at this point I’ll continue to grin and bear it in hopes that the good Lord will bring a healing to my mind, body and soul and keep giving me that inner strength and intestinal fortitude to cope each and every day. So it’s Monday morning and after a long weekend, I’m tired as hell. I’m not fatigued from partying or anything, I’m just getting old aiiight. Now normally on mornings like these when I have to sit in long staff meetings, I grab a Red Bull. However today I’m trying out a new product, it’s Inko’s White Tea Energy drink. Now I’ve been a huge fan of Inko’s White Tea’s for a lil’ over a year now. I’m famous for picking up new products when shopping at my neighborhood health food store and one day their products caught my eye. I realize that I drink way too many juice products which contain high fructose corn syrup and so I’ve been doing my best to cut back. Their product does not contain that evil ingredient. I’m not gonna even front, I spend a good amount of money every month on their white teas now. 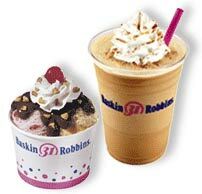 They’ve got a lot of flavors and I’ve had almost all of them. Although I really like all the flavors I’ve tasted, my two favorites remain the white teas infused with Blueberry and Honeydew respectively. Anyway, back to this Inko’s White Tea Energy drink. I was fortunate enough to receive some samples of their new product which has yet to hit the open market. I guess you could say that I’m a one man focus group. I sat at my desk, cracked it open and drank the entire can within about 10 minutes. The one thing that I really like is that it’s not carbonated. All the other energy drinks I consume from time to time are carbonated. After taking a couple of swings, I can dig the taste. It kinda reminds me of a lemon tea with lil’ bit of ginger in it. Now anybody who knows me knows I love ginger anything. I love ginger ale, ginger beer, gingerbread, ginger snaps and any other kind of healthy ginger drink. I can taste a lil’ bit of the ginseng and guarana, but it’s not overpowering. This is pretty good as far as the taste goes. But the true test is whether it’s gonna keep me awake and alert. Time for my Monday morning meetings… we’ll see. Okay, it’s been a few hours and to be honest I forgot that I was even sleepy. Now I’m not going to attribute everything to the energy drink, but it sure did give me a pick-up. After sitting in the first meeting for close to an hour, I did a good amount of running around the building. I wasn’t running literally, but you got what I’m saying. I’ve drank products that tasted good that didn’t even raise my eyelids when I was sleepy. I’ve also had energy drinks that tasted awful that got me so wired that I thought my heart was going to jump out of my chest. This stuff right here tastes pretty good and didn’t overwhelm me as far as taking over my body. It gave me a lift and I didn’t even think twice about it. That’s a good thing. Lord knows I had days when I used to take Ephedra when tired and I thought I was going 100 miles a minute, but when I slowed down I felt like I was trying to run in a peanut butter pasture. 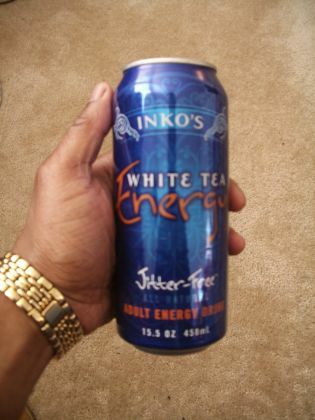 So overall, I give Inko’s White Tea Energy drink two thumbs up. I’ve got one more can left and my next test is to take it with me to the movies when I go to a late show. I fall asleep in movies during matinees. It doesn’t matter what the movie is, those chairs get real comfortable. I’ll just have to see how this one works in that environment. That’s a real test right there. Anybody else drink these sort of drinks for that pick me up in the morning or before working out? Please, no discussions of Starbucks or coffee cuz that stuff is nasty!!! As this weekend approached, I began to reflect on my days spent at Howard U. I proudly rep my alumni status on my license plate frame already, but there’s a lot more to it than that. I remember enrolling at the university in the Summer of 1993. My previous college experience had been at Prince Georges Community College in Largo, MD where I obtained the necessary credits to transfer to Howard University. I honestly never had dreams of going to college when in high school as a lot of folks did back then. My SAT scores weren’t exactly good either, okay they were terrible!!! Through some forces of nature (a recruiter at KFC), I ended up taking the ASVAB test and achieved miraculous numbers on that test. Shortly thereafter I enlisted in the US Navy. The time spent in the military was a series of life events that I’d assume wipe like an eraser to a chalkboard. However, after a shoulder injury and an honorable discharge brought me back home sooner than expected, I found myself contemplating my options. In January of 1993, the Veteran’s Administration gave me the surprise of my life. Being that I was a service connected veteran, they awarded me the opportunity for Vocational Rehabilitation. This basically meant that they were going to provide the full tuition for me to attend college. My choice without question was Howard University. I had spent many a day at Howard during the years that Ma had worked there at the Allied Health building when I was a kid. I almost felt like I was going back home in a sense. That day came in 1993 when I stepped into that first class. It was an African-American Studies class with Professor Nikongo Ba-Nikongo. Maaaaaaaaaan… that class was not easy for me at all. I wasn’t really in the habit of studying that much and my classes at PG were at night. I was still working that summer as an inside sales rep for an electrical supply company. They allowed me to attend classes in the morning and come to work mid morning. I had to really apply myself in this class. It was far from simple, but I passed. Over the next 7 years I experienced moments that will be with me for a lifetime. Yeah, I said 7 years. There was never a semester that I wasn’t working full or part time in some capacity, interning somewhere or a combination of both. I was busy from the day I set foot in on the grounds at Howard U, ‘til the day I graduated. I learned a hell of a lot in the School of C (Communications for my non-Howard folks) while Majoring in Radio-TV-Film. I will forever remember the guided instruction of Dr. Judi Moore Latta in my Scriptwriting class, the hands on lessons in the studio from Ted Roberts (aka The Crazy African) and Candy Shannon in Radio Production and Advanced Radio Production classes. I still remember how astonished I was when walking into my History of Broadcasting and Film class to see a white dude was teaching the class. Yet, Professor William Barlow was one of the coolest white cats I had ever had the pleasure of taking a class with and he knew his stuff. Rumor had it that he was married to a Black woman… lol. Getting over to my Minor which was Sociology, there was really only one instructor who stood out to me. That man was Dr. Ernest Quimby. Dr. Quimby was not just a professor, but a good friend. As much as I enjoyed all those Criminal Justice classes throughout the years (especially the Mock Trial classes), the one thing that sticks with me more than anything is that I could talk to Dr. Quimby about anything. No matter what our discussions were about I always felt encouraged walking out of his office or classroom. When dealing with some real life (divorce, health) issues that almost drove me into depression, it was that good brother who kept me optimistic. With his help I remained focused on my studies and didn’t’ allow circumstances to keep me down. Dr. Quimby without question was the most influential person in my years spent at Howard. I didn’t really spend a lot of time partying or going to events because I didn’t have the time. I wasn’t as young as most of the kids enrolled at Howard. In fact, a lot of them called me ‘Uncle’. I wasn’t that much older, but I for the most part I always came to class before or after work and was in business attire. Walking around campus with a suit and tie and trying not to sweat was not an easy task. There were days when I had classes at the top of the hill and the next at the bottom of the hill and then back at the top. 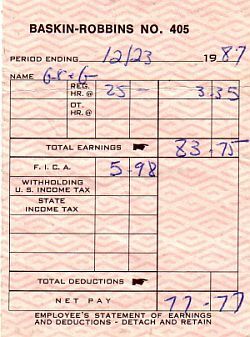 The internships that I worked while in school were worthwhile as well. My most memorable experience was working on the Partners of the Heart project. The project focused on the life of Vivien Thomas, an African-American surgical technician who helped develop procedures used to treat Blue baby syndrome in the 1940s. He rose above racism and poverty to become a pioneer of cardiac surgery. At the time when I was at Howard well known Hollywood director/actor Bill Duke was the Chairman of Radio-TV-Film at the School of C. Bill Duke was the Director for this venture. His being there opened up opportunities for student to become involved in numerous projects; however this one was the grand prize. If I recall there were hundreds of students who interviewed for this one and only a handful selected. I remember throwing on my sharpest suit and shining up my briefcase (with leather cleaner) the morning of the interview. I walked in the room and knocked em out. It was like I had ice water in my veins. For the next year or so I was involved in various aspects from production meetings to doing research at the National Library of Medicine to logging recorded footage. Although the date (February 10, 2003) that Partners of the Heart aired on PBS, I had EVERYBODY watching. I felt a sense of pride in watching it although I didn’t have a major part. But as the credits rolled at the completion I saw my name. I even hit REWIND and PAUSE and sat there glowing for a while. I still have all my materials from that project. All the scripts and notes from production meetings. Since that time, an actual film on the life of Dr. Vivien Thomas has been made from the documentary entitled Something the Lord Made featuring actor/rapper Mos Def. I really could sit here and write for days about previous homecomings and stuff like that, but I wasn’t really in the young frame of mind like a lot of the folks back then and can’t say honestly that I lived the college life. I attended games, step shows and other events here and there, but nothing that really stands out. I saw Sinbad do a stand-up comedy show, a young Maxwell open up for Groove Theory and numerous fashion shows and plays over my years there. When the premiere of the movie The Best Man was shown back in ’99, I took my then 15 yr old sister up to campus with me to check out the movie. I’ll never forget what she said as we stood there in front of Cramton Auditorium. “Look at all the Black people” she exclaimed. I had to remember that she probably had never been anywhere close to Howard and that seeing 1000 Black faces were like a huge family reunion for her. I assisted with the sound crew back for Yardfest in 2001, but that was well after my graduation. The culmination of my 7 years of hard work was the day I received my Bachelor’s degree. There are no words to describe my joy that day. Seeing the smile upon Ma’s face was enough for me. Dad had travelled from Charlotte that day as well to be there to share in the occasion. When I say he had just got off the plane, I’m not joking. That man caught a cab straight to campus and lugged his suitcase in hand for the entire morning of the ceremony. It was kinda funny if I may say so myself. So looking back at Howard with wonderful memories bring a big smile to my face. At 34 yrs old I don’t see myself hanging out on Georgia Avenue as I did in years past or going to any of the parties featuring celebrities. I’ll just sit back and enjoy this weekend with reflections of goals achieved and blissful times. Happy Homecoming Howard University!!!!! Any other Howard University folks out there… or those who have wonderful memories from their college days? The bad news is that it was towed. Why was it towed you ask? Well, it seems as though the homeowner’s association in my neighborhood does not know how to communicate things properly to their residents. Now I have one space assigned in front of my house and the spaces in between the assigned spaces are totally blank. Also we have designated areas where the word VISITOR is painted in the parking space. Since it’s me and my younger cousin at the crib, we have a total of two cars. We both look out for one another and the first one home always takes one of the BLANK spaces, so the other has the space assigned to the house. Now we’ve both been parking in those BLANK spaces for sometime now without an issue. Apparently according to some regulation that we were not advised of, anyone parking in a blank space without having a valid permit is subject to be towed. That’s what happened. Those jokers towed me because I didn’t have some stupid permit that I had never even heard about. Now, I’ve had folks come over the crib and chill once in a while, my fiancé sometimes spends the night and we’ve never had a problem with anyone parking in one of the BLANK spaces. For some reason last night they decided to enforce this stupid regulation and off went my ride. In the meantime I called and spoke with the HOA about the situation and they apologized for the inconvenience, the error in not advising us of the parking regulations and promised to reimburse me once I retrieved my car. Maaaaaaaaaan… I didn’t know whether to shout at them for the incident in itself or be happy that I knew that I was not in the wrong. I went and got my car from the towing spot and shortly thereafter I paid a visit to the HOA office to get the 2 permits required for the parking lot. The lady was kind and again, very apologetic. I was still kinda pissed off and she couldn’t get a smile out of me this morning though. I did the paperwork, got the stickers and hit the Beltway. Anyway, I’m just sitting here at work. Of course the folks here wanna know what happened cuz the first thing I did this morning was to call my boss and say “they got me again maaaan”. I had to go though a rack of changes to get here, but I’m here nonetheless. I suppose I should stop being angry and just be thankful that it wasn’t worse.